Critics slam deal as Qatar gets U.S. war technology despite terror financing, hacks on U.S. The United States is planning a $200 million military sale to Qatar, despite recent revelations the country funded a spy operation on American Jews and conducted hack attacks on U.S. citizens, according to multiple sources familiar with the effort who described the timing of this sale as "spectacularly bad." The Trump administration has signed off on a new military deal with Qatar to provide it with $197 million in military technology to enhance and upgrade its Air Force, according to the State Department. The sale comes at a challenging time in U.S.-Qatar diplomatic relations, as lawmakers on Capitol Hill pursue an effort to launch a federal investigation into Al Jazeera—the Qatari-backed news outlet—following disclosures the country funded a secret, months-long spy operation on American Jews on U.S. soil. While the deal is likely to be approved by Congress's foreign relations committees, which control such deals, many insiders are beginning to oppose the sale as a result of Qatar's ongoing financing of terror groups such as Hamas and its recent efforts to hack a prominent Republican-tied fundraiser. Qatar has grown closer to Iran in recent months as U.S. allies in the region attempt to isolate the nation as a result of its financing for terror groups and use of Al Jazeera to disseminate propaganda across the region. 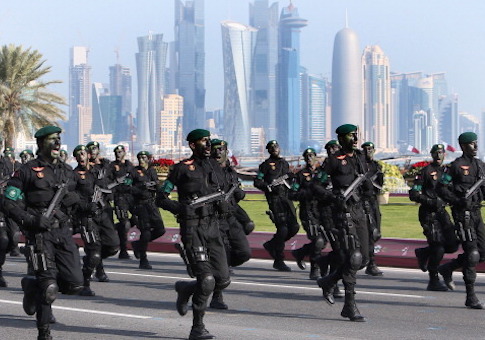 Critics of the military sale say the United States is straddling an ever blurring line as it seeks to bolster military relations with Qatar—the host of one of America's largest air bases in the region—while cracking down on its ties to Hamas and other terror groups. "The timing is spectacularly bad for this sale," one veteran congressional adviser who works on Middle East issues told the Washington Free Beacon. "In just the last few weeks the Qataris have gotten themselves wrapped up in hacking campaigns against American citizens and infiltration operations against American Jewish organizations." "They're still jerking the chain of our Arab allies on the Brotherhood and the Israelis on Hamas," the source said. "This sale might go through because there's so much money involved, but people are beginning to ask again why we're supporting these guys in the first place." Qatar's U.S. lobbyists, in filings with the federal government, have been pressuring lawmakers to rollback efforts to combat financing for Hamas and other terror groups, claiming such efforts interfere with the U.S.-Qatari relationship. Qatar claims that congressional efforts led by Rep. Brian Mast (R., Fla.) to crackdown on international funding for terrorism "erroneously and unfairly" targets Doha, according to these filings. It is likely that the upcoming military sale also could conflict with that legislation, further complicating efforts by the U.S. to bolster Qatar's fighting forces. "If Qatar's Washington lobbyists are concerned about the Mast legislation with regard to the sale of F-15s, this Foreign Military Sale to Qatar would likely fall under that pending bill as well," noted one opponent of the sale who would only discuss the matter on background. Recent reports claim that Qatar has damaging information about Trump adviser and son-in-law Jared Kushner, but declined to provide the information to U.S. authorities investigating possible collusion between the Trump administration and Russia. Qatar also has been implicated in a targeted hack campaign of U.S. Republican fundraiser Elliott Broidy, who claims the country penetrated his email account and passed the information to American news outlets. Qatar's Al Jazeera news outlet was recently found to have conducted a months-long spy operation on U.S. Jews and individuals associated with the pro-Israel movement for a documentary the news outlet claims will expose Jewish control in American politics. The documentary, which has yet to air, has stirred controversy in Washington, D.C., and prompted a bipartisan team of lawmakers including Sen. Ted Cruz (R., Texas) to call on the Trump administration's Department of Justice to launch a formal investigation into Al Jazeera to determine if it should register as a foreign agent under U.S. law. As these controversies mount, the Trump administration quietly announced the $197 million military sale, which it says will help Qatar carry out anti-terrorism operations. "The Government of Qatar has requested to purchase equipment and support to upgrade the Qatari Emiri Air Force's (QEAF) Air Operation Center (AOC) to enhance the performance of integrated air defense planning and provide US-Qatari systems interoperability," the State Department and U.S. military announced last week. The sale will include advanced technology including GPS systems, "anti-spoofing" equipment, encryption technology, as well as training to use this equipment. The U.S. also will provide secure communications equipment, cybersecurity services, and other equipment to boost Qatar's fleet. "This proposed sale will contribute to the foreign policy and national security of the United States by helping to improve the security of a friendly country that has been, and continues to be, an important force for political stability and economic progress in the Persian Gulf region," the State Department said. "Our mutual defense interests anchor our relationship and the Qatar Emiri Air Force (QEAF) plays a predominant role in Qatar's defense." The deal faces scrutiny in light of Qatar's recent actions against the United States and is raising questions on Capitol Hill among those who view the sale as rewarding Qatar at a time when Congress is calling for a federal investigation into its activities. "As Qatar continues to fund terrorism and run a propaganda outlet, Al Jazeera, that has carried out a spy operation in Washington, D.C., now is not the time to be approving $200 million in military equipment to Qatar," said a second foreign policy insider familiar with efforts to investigate Qatar and Al Jazeera. "Given increasing congressional concerns about Qatar, they will give this the highest scrutiny—and so they should," the source said. "MAGA voters didn't go to the ballot boxes to support a President Tillerson, they wanted their Donald. If he doesn't want to lose their support, President Trump will need to get the Tillerson wing of his administration under control." This entry was posted in National Security and tagged Military, Qatar, Rex Tillerson, Trump Administration. Bookmark the permalink.